As we soar into Iron Man 3 season, I think we all know folks who still haven't let the first film go. So stamped on their brains is the red and gold avenger, 'Iron Man' is their answer for everything. 'Where is the remote?' 'Iron Man.' 'Did you take out the trash?' 'Iron Man.' 'Who can topple Obama?' 'Iron Man.' 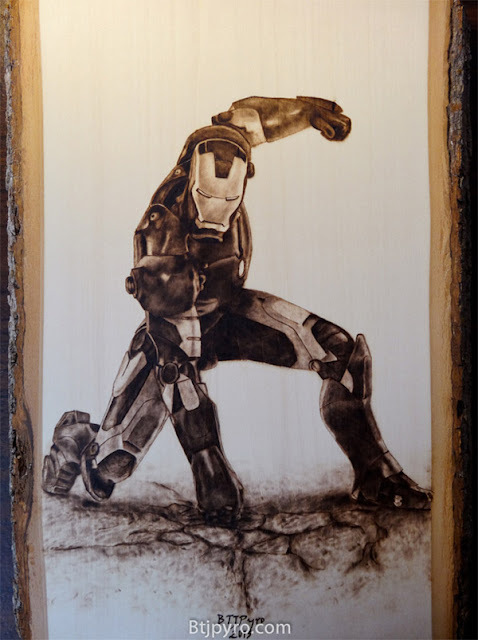 Kinda like this guy, who actually burned Marvel's heavy-hitter into wood... think about the skill level required there for a minute and then check out the detail. Five and a half invincible non stop hours of work, equals one 10 x 13" plank that you would kill over if someone ever chucked it on the fire. What do you think? To see more great BTJ Pyrography including The Walking Dead and Rouge with Gambit, just click the jump.